A&M-Texarkana Presents Black History Month Celebration. TEXARKANA, Texas – Texas A&M University-Texarkana will sponsor a Black History Month Celebration Wednesday, February 6, from 11:00 an until 1:00 pm. The event will feature a musical performance by Brandon Brown, also known as Griot B, as well as keynote speaker Dr. Brian Matthews, TAMUT Assistant Professor of Management. This free event is open to the public and will be in Eagle Hall. Chick-fil-A is serving the attendees. Brandon Brown is a former history teacher from Inglewood California. Most of his students were African-American and when he needed a way to increase their enthusiasm for his subject matter he turned to rap music. By creating rap music about his history lessons, he was able to engage the students better and eventually raise their test scores 14%. TAMUT’s Campus Activities Board, Black Student Union, and the PATH (Personal Advancement Through Help) program are sponsoring the Black History Month Celebration. TAMUT set to host The Speaker of the Texas House of Representatives. 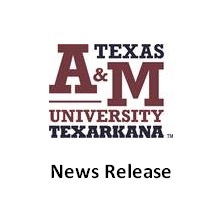 TEXARKANA, Texas – Texas A&M University-Texarkana will be hosting Dennis H. Bonnen, The Speaker of the Texas House of Representatives, along with Representative Gary VanDeever and Texas A&M University System Chancellor John Sharp on campus Thursday, February 7. The Speaker and guests will be on campus from 3:00 pm until 4:45 pm to visit with current students about issues and opportunities in higher education, tour the TAMUT campus, and speak with science students about their ongoing research. These events are not open to the public, but we welcome our local media members to campus during that time. For more details about the visit contact John Bunch, A&M-Texarkana Communications Manager, at jbunch@tamut.edu.